Image courtesy of WSDOT: Graham Contracting has a preliminary design for the Montlake phase of the State Route 520 Bridge Replacement Project that could advance and spare the Montlake Market building from demolition. Editor's Note: Here are the results of a poll of attendees of the Jan. 30 meeting. It will take longer and cost more money to save Montlake Market during construction of the Montlake phase of the State Route 520 Bridge Replacement Project, but residents at a January WSDOT meeting remained steadfast in their desire to keep their small neighborhood grocer. 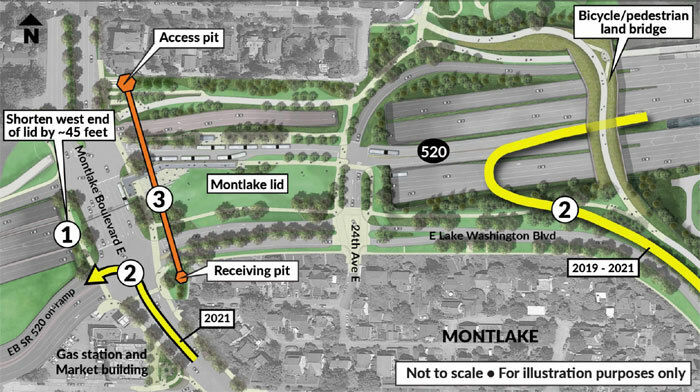 The Montlake Market was removed and later added back into plans for a reconfiguration of Montlake Boulevard for the next phase of the SR 520 Bridge Replacement and HOV Program, which includes a new West Approach Bridge South for eastbound traffic that will connect to the floating bridge over Lake Washington, a lid over 520 and a bicycle/pedestrian land bridge east of the lid that connects the Washington Park Arboretum and East Montlake Park. Last session the state Legislature added a proviso that directed WSDOT to spare the market building from demolition if feasible. WSDOT did not a have preservation plan for the market, located southeast of the SR 520 off-ramp to Montlake Boulevard, during its last community meeting on Nov. 7. WSDOT awarded Graham Contracting Ltd a $455.35 million design-build contract for the Montlake Project in October. The contractor has developed a preliminary design that would reduce impacts to the market building, which was shared by WSDOT during a Jan. 30 community meeting. More assessment is needed to determine if it is feasible, said WSDOT director of construction Dave Becher. “There’s a certain risk inherent in all of these,” he said of the three design proposals Graham came up with to avoid needing the market and adjacent 76 gas station site. A final environmental impact statement in 2011 had recognized community support for the market and didn’t plan for its condemnation. When WSDOT did a reevaluation in 2016, it realized it would need the property after all. Montlake Boulevard needs to be raised in order for the new SR 520 under it to meet a required 16.5-foot clearance, which would only impact the 76 station, said WSDOT deputy engineering manager Todd Harrison, and the new structure needs to be three feet thicker due to seismic reinforcement requirements. A 54-inch-diameter water line under SR 520, on the east side of Montlake Boulevard, needs to be replaced, and a King County combined sewer line needs to be avoided. With a commitment to the City of Seattle to maintain all lanes of traffic on Montlake Boulevard, Becher said, that would mean shifting traffic further west, affecting the Montlake Market site. WSDOT had been proposing to build the new water line beneath SR 520 with a tunneling pit that started south of the highway and worked north. Graham proposes reversing those plans, meaning the larger access pit would be sited on the north, Becher said. If it turns out the waterline needs to be relocated somewhere else, he cautioned, traffic could still end up shifting to the west, requiring use of the Montlake Market property. The eastbound on-ramp to SR 520 from the Washington Park Arboretum will go away with the removal of the old bridge structure, requiring motorists to use Montlake Boulevard. Graham proposes constructing a temporary on-ramp later this year that would loop from East Lake Washington Boulevard to the West Approach Bridge North, which will be reduced to two lanes both ways when the south structure is removed; tolls will remain in place. The temporary on-ramp would be used through 2021, and then a second left-turn lane to the eastbound SR-520 on-ramp would be added on Montlake Boulevard. Whether the market building is spared or demolished, WSDOT still expects to acquire the property. The WSDOT Accountability Coalition that formed to save the market lost a legal fight to stop the purchase, and the cost of the acquisition will likely be decided through a just-compensation trial, Becher tells MPT. “We’ll have our appraisal, they’ll have their appraisal, and then we’ll work it out,” he said. Austin Hicks, manager of corporate relations at Strategies 360, which represents the coalition and Montlake Market owner Scott Baker, said the property alone has been assessed by the property owner at around $20 million. The Graham preliminary design makes it clear that there are project elements that can be changed to spare the market, Hicks said. “Really, the only decision left would be staging,” he said. WSDOT also wanted the Montlake Market site for a staging area for construction equipment and materials. The cost of finding additional staging sites, presumably leasing property for 2 1/2 years, would add up, Becher said. None of the estimated costs WSDOT provided during the Jan. 30 meeting were exact, as they would need to be negotiated with Graham Contracting, said Becher, adding they could end up higher or lower. “It’s a pretty big impact to the contractor,” he said. Options that preserve the market will add time to the project beyond the base contract, Harrison said. Graham Contracting has already committed to finishing the Montlake Project a year early. “The less space you have, the more time it takes to work,” Harrison said. While Graham Contracting was the lowest of three final bids WSDOT received for the project, the cost was still $30 million more than the transportation department’s highest estimate. Removing the building would be the zero-cost option, save for acquiring the site, which is expected to be completed later this summer. Keeping the market building upright and operational is estimated to add 45 days to the project — about $50,000 more per day — which is estimated at $15.3 million to $20 million in added cost. Becher added the business owner would have to also be willing to keep the market open during construction; additional traffic controls would be needed to ensure people were able to safely travel there. WSDOT interprets the legislative proviso as requesting the transportation department address preserving the building, and not the business. Just keeping the building, leaving it vacant and not operating during construction, is estimated to cost $7 million to $10.15 million. The building could be reused later, Becher tells MPT, or surplused and sold to the highest bidder. He said he knows residents want to have their market. There is also the unknown cost of site remediation, particularly contaminated soil and groundwater discovered around the 76 station’s gas storage tanks and pumps. The transportation department found petroleum-related contaminants during soil testing in the public right-of-way near the Montlake Market and 76 gas station site in 2016 and 2018, according to WSDOT. Becher said WSDOT had been trying to test the market and gas station site since August 2017, but needed to go to court to get approval due to objections by the property owner. Innovex Environmental Management completed the Third Supplemental Phase II Environmental Site Assessment for WSDOT in December, submitting its report to the transportation department on Jan. 16. Twenty-one borings were conducted, with groundwater samples tested from 10 of those borings. Innovex analyzed samples for gasoline, diesel and lube oil-range hydrocarbons, volatile organic compounds, semi volatile organic compounds, polychlorinated biphenyls and pollutant metals. Innovex reports finding contaminants in soil samples above the allowable levels under the Model Toxics Control Act (MTCA) in six borings, and the same for groundwater tested from those six borings. The property owner commissioned engineering firm Hart Crowser to do its own environmental site assessment. “It amounts to what could be a pretty routine cleanup,” Hicks said. The report, which challenges interpretations of WSDOT’s data, states remediation could be accomplished without needing to demolish the market or impacting its operation, and the gas station likely could also remain. Becher said there is more testing left to do around the site, including under the market. “We really don’t have a complete understanding around the site yet,” he said. The state attorney general’s office is working with the property owners to determine what cost they would assume for cleanup, Becher said, which WSDOT would likely carry out.